Today we have this new trick which is Nose Grab Jump. Jump variations and grabs are always welcome as they add something to the most fundamental of moves without, hopefully, the need to hammer yourself too much in the process. It’s always a delight to see someone boosting and banging out numerous different grabs, making each jump different and the whole performance more pleasing to the eye. This time around it’s the nose grab, the most opposite of the most common but deservedly adored tail grab. This one is a great way to show off your board and any promotional stickers adhered to it as with the majority of jumped grabs you’ll be grabbing the nose with your back hand whilst keeping the kite flying and yourself hanging with your front hand. All that you need is a half decent take off and if you’re already comfortable grabbing anywhere else and freeing your back hand then you’re ready. After Take Off Pic A. Assuming that you can jump directly after take off check your balance and then casually grab the tail. To grab the nose from your big chill position with both knees up will be very difficult unless you’ve been hard at the yoga. As a result there are a couple of points worth your consideration. No-1 is a good positive kite send, with a decent pull and push on the bar to get the kite moving back past 12. Going up with the kite behind you will rock you back and as a result bring the nose of the board up. Secondly bring your front knee up towards you. Thirdly leave your back leg straight. And finally aim to get the grab in on the way up, before you redirect the kite so that the bar is not in your way. In the photo straight away after takeoff, the rider’s kite is behind her and as a result her legs are penduluming up in front of her, much like those early days of trying to jump but forgetting to bring the kite forward. Her shoulders are leaning back and her front knee is lifted. Go for it Pic B. As mentioned, going for the grab early is key to reaching the nose of your board without being made of elastic . In this image the rider extends her back arm towards the nose whilst bringing her front knee right up towards her chest and extending her back leg down and away from her. You can see that she is still leaning back and that the kite is still behind her, and therefore even though the bar is sheeted in, it’s not in her way. She reaches for the board by leaning back and twisting her back shoulder around behind the chicken loop, and not by leaning forward towards the nose. Use Your Hands Pic C.
Once the job is done and you’ve reached your grab your hands will do the rest of the work. The rider has grabbed her board firmly and holds it, pulling it towards her, which helps her to keep this position for as long as possible. With the board held close she can now also redirect the kite to around 12 to get some support and hang. You can see that she has given the bar a hefty pull, and this is on a 7m, to get the kite back up and parked so that she stays up and floats. In Flight Entertainment Pic D.
As with all grabs they’ll look better if you hold them on the way down. This does however mean that you’ll have to get the preparations for landing set with one hand! Having sent the kite hard you have the advantage of being able to lean on your front hand throughout this move, once you’ve got the grab, without the kite diving aggressively. However as you come down if the kite drifts slowly around the edge of the window you will have trouble finding power to land, so you’ll need to get it moving through the window as you descend. 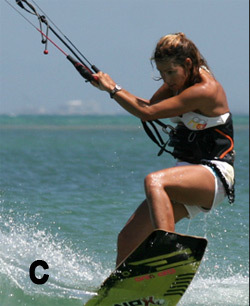 In this picture the rider is holding her grab but has started to pull hard on her front hand to get the kite moving and ready to dive. Now in final the landing should be as for any other jump. We can see that in anticipation the rider has dropped her grab and let her legs fall underneath her. With two hands on the bar she can dive the kite and keep the power on by keeping the bar in. As the kite pulls she goes with it aiming to land tail first with the board pointing quite downwind. Landing over the board she can then carve back onto her edge and set up for the next one. 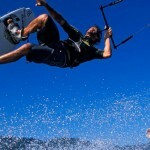 The best tip is to start off by trying some jumps with a decent push and pull, to find a comfortable equilibrium between leaning back and staying in control, as you don’t want to be swinging way up with your kite stuck down behind you. Now let’s talk about 2nd best tip, once you’re comfortable with this try bringing your front knee up and straightening your back leg. Finally once you’re confident get the back hand off soon after takeoff and twist round for the grab. If you’re penduluming up and crashing down onto your back your take off is catching you out. You can only send the kite hard if you keep your edge until you lift off. If you’re losing your edge or letting the bar out before lift off your kite will fly too far back. If this is the case calm the send down a notch or two. If you can’t reach the grab, you’re either going too late or reaching forward for the nose. Lean back and twist round. That said if your foot-straps are too tight, it can be difficult to lift the front knee and straighten the back leg, as your feet need to roll in the straps slightly. The airgybe to toeside is a trick that makes turning much more fun. Instead of just stop and change direction, you jump and fly around in a U-turn. When you do this trick come in with moderate speed, since it will be damn hard to take the landing in high speed. Keep the kite at 11:15 or 14:45 and to make sure that you come in with to much speed, carv hard up wind, so when you pop out of the water you fly up and not forward like in a normal jump. Once airborn let the kite pull you upwards and keep the bar close to your hip. When you feel that you´re on your way down, steer the kite aggressively in the opposite direction at the same time as you rotate your hip. Spot your landing, point the board downwind. When you land carve upwind on your toeside edge, that’s it! 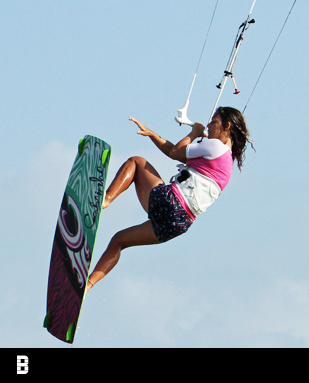 The pop backloop is often the first kite trick that kiters learn and once you master it you’ll be eager to learn more advanced tricks. Speed. You need speed or else the board will stop in the water when you edge hard upwind. 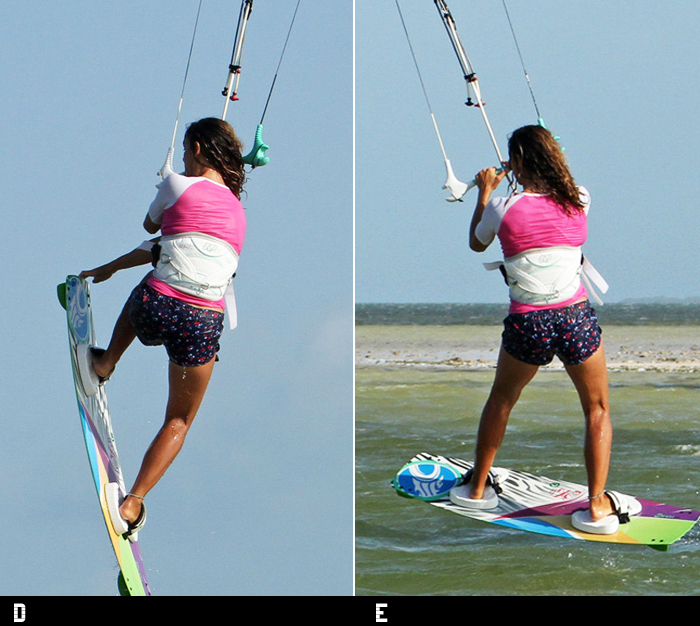 To gain speed you’ll have to momentarily point your board downwind, just before you start edging upwind. You will be physically jumping up off a coiled back leg, whilst edging the board, corking yourself up and out of the water. You will not use the kite for a lift, so park your hands close together on the bar. This means that you’re sailing with kite at 11-11:30 or 12:30-13:00. Having the kite heigher will give you more lift. So, you’re are mentally prepared and you’re ready to start the backloop pop. Now follow these steps. 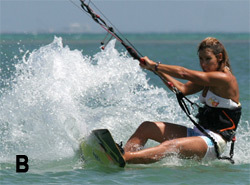 Relax your legs, so that you’re not pushing the board away from you and kite downwind a few meters. Once you gained enough speed, start carving quick against the wind, up to almost 45 degrees across the wind. At this point push the board away from you with your legs and turn your shoulders back up the wind. This will initiate the rotation. Keep turning away from the kite and you’ll continue the rotation in the air and hopefully land nice after turning about 270 degrees (the first 45 degrees are performed with the board still in the water). 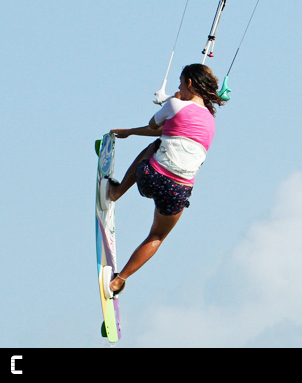 Keep your kite at 45 degrees and enter the trick with moderate speed and power. Edge very hard and pop out of the water and throw your feet at the sky above your shoulder. Just as you come of the water turn your head and try to look over your shoulder in the direction of the spin. Keep looking over your shoulder until you spot the water. focus on the spot where you want to land. Bend your knees, point the board downwind and land. Tips! Keep looking over your shoulder, if you stop looking you will stop spinning. Keep your hands in the middle of the bar. Stay relaxed, if you spin to hard, it is going to be very hard to land without slipping out. At first if you cannot get the full rotation, then try to bring the kite lower.